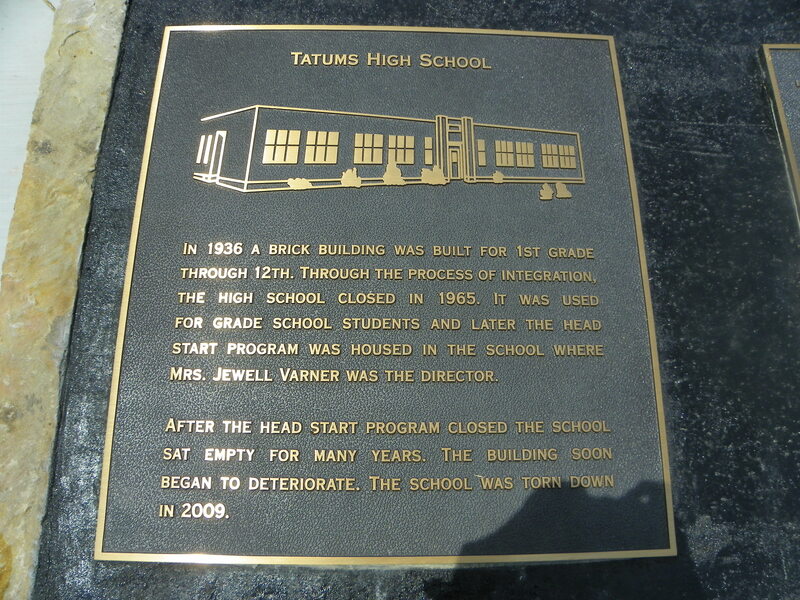 The Tatums School is a ten-room, single-story, rectangular shaped 044′ x 59′) structure. It is constructed of red brick which has been painted white. It has a flat roof with limestone capped parapets. Entryways are recessed, while the front entry is framed with modified pilasters and a roof line cornice. A green sunscreen has been added to the upper portion· of the aluminum sash windows, placed by threes, that rest on brick sills. A small wellhouse has been added to the north end of the building, and a courseway for the handicapped has been built for the front entry. These additions in no way impair the original integrity of the structure. 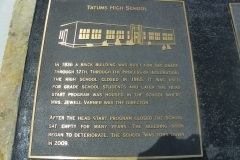 The Tatums School is distinctive to Tatums, a totaly black community, for its type, style, scale, and workmanship. It is significant to note that its construction provided work for many unemployed oil field workers and agricultural laborers during the depression. For fifty years it has served the community well by promoting learning in an area with limited educational facilities.